Tumbled Celestite healing gemstones that are 5/8 to 1" in size and just heavenly in their energy. Celestite allows us to recall and acknowledge our spirituality and the gifts of the divine. Heals the aura, astral body and light body and aligns them. Fosters a connection and ability to work with Goddesses, spirit guides, angels, nature divas and ascended beings. Advances channeling, brings information and light for core soul healing, psychic development, spiritual and karmic growth. Evokes peace. Celestite has an Orthorhombic crystal system and is in the mineral class of Sulfates. Its coloring is generally pale blue to deep and splotchy blue, but it can be white, colorless, a red-brown or orange. It is usually found in sedimentary rocks, mainly in cavities in sandstone or limestone. It can also be found associated with fluorite, calcite, gypsum, dolomite, galena or sphalerite, where its coloring is generally blue. The blue is attributed to the presence of minute amounts of gold. In varieties from China, a deep, persistent blue is achieved from irradiation. White, elongated crystals had been abundant in Sicilian sulfer mines, and large, white blades are found in England at Yate, Gloucestershire. There are many places in the US that it can be found in its blue color, but a colorless variety is found in the Death Valley area, and an orange variety occurs near Colorado Springs. Right now, some of the best is coming from the Bombetoka Bay area in Madagascar. Celestite is best used to meditate with and aids in manifesting the element of water and our ability to flow with life. Ideally, place in the bedroom, or meditation space as an environmental cleanser. A soft stone (both physically and metaphysically), its vibrations radiate in all directions. Celestite allows us to recall and acknowledge our spirituality and the gifts of the divine. It may be used to balance and stabilize outward forces with our own energy fields, and in this way clears and perfects the chakras. A stone for astral travel, it provides the freedom to access specific sites and aids us in surrendering to the inner peace required to do so. It is also good for aiding in dream recall. Celestite promotes a pleasant disposition and can provide us with good communication skills. It provides a cleansing of areas of affectation by transforming pain and chaos into light and love. Celestite brings us hope in times of dispair by providing calmness and harmony in our life and the dismissal of worry. It aids those in pursuit of music and the production of the fine arts of watercolor, jewelry making and design. Celestite has been used in the treatment for disorders of the eyes, to increase the range of hearing and to balance mental dysfunctions. It provides balance in the cellular structure and facilitates the elimination of the toxins of negativity and destruction, and may be used for treating a dysfunctional intestinal system. 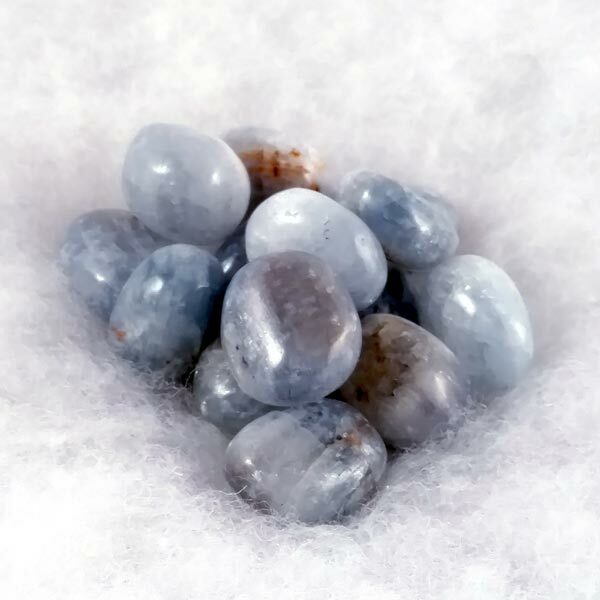 Celestite has a special affinity with those whose sign is Gemini. Its Energy is Receptive, its Planets are Venus and Neptune, and its Element is Water. It is very beneficial to musicians, artists and those whose jobs require creativity. 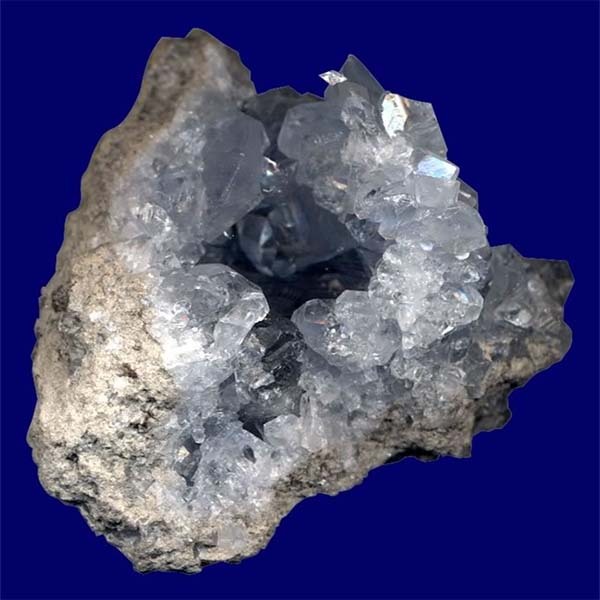 Some records indicate that Celestite was given its powers by angels to raise consciousness, and to bring guidance from them. Some believe that Celestite is inhabited by a fairy of good fortune. It is said to promote compassion for the earth and our fellow creatures and has long been used for a connection to animal and spirit guides.